In July 2017 I gleefully wrote from a Coffee Bean and Tea Leaf in Osaka. I used to go to their branches all the time after school and on weekends in Singapore, so to see that familiar circular logo tinged with a delightful schade [sic] of purple this time was a real treat. 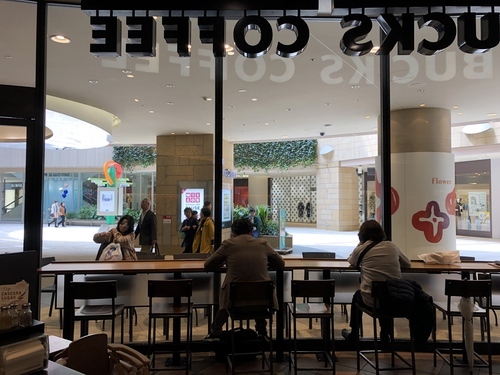 Little did I realise that Osaka in general would have the same effect on me, and this particular Starbucks in Namba Parks. I place coffee shops and cafes in two distinct categories: you want the world’s best coffee, go to a coffee shop. You want to chill somewhere and hack on some code or prose, go to a cafe. And this one complex has the world’s best Starbucks downstairs, and the best park bench view upstairs. I love going to Tokyo for AsiaBSDCon and to explore, but there’s something special about the Kansai region of Japan. Kyoto is now my favourite city in the world, and I have a soft spot for Osaka. It’s not just because I think it’s nicer than Tokyo, but it was Clara’s and my first destination to Japan, so it will always hold a special place. It also holds significance for what I’m typing on. This time around I’m blogging on my Japanese Panasonic CF-RZ6 that I’ve put FreeBSD on. I don’t want to discuss a certain fruit company here, but I’d forgot what a joy it is to type on a nice laptop keyboard again. The keys themselves are tiny on account of this laptop being smaller than some iPads, but they’re a perfect fit for my spindly fingers. And they feel so responsive with a solid amount of key travel. Dare I say it’s the best mobile keyboard I’ve ever used. Anyway, Clara is patiently sitting next to me reading, so it may be time to head off. I’m just so happy to be back here, even if its only a day trip from Kyoto. If you want a great introduction to Japan, consider flying to Kansai Airport and exploring Osaka first. It has so much of what Tokyo has, but at a more accessible scale. And I love hearing the Kansai dialect everywhere :).